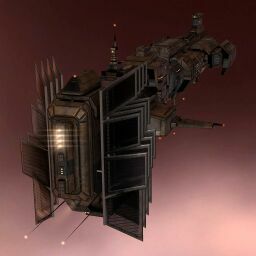 The Cyclone is a Minmatar Battlecruiser and, unlike its brother the Hurricane and most other Minmatar ships, the Cyclone is bonused towards missiles rather than projectile turrets. Unlike the Drake, which is designed to mount a large buffer tank and deal most of its damage with kinetic missiles, the Cyclone is bonused to take advantage of shield boosters to mount a massive active tank, albeit for a only limited period of time, while its rate of fire bonus allows the Cyclone greater flexibility in terms of the damage types it can use. The Cyclone also has a decent dronebay and bandwidth 50m3, allowing it to field a full flight of medium drones for extra DPS, or two flights of small drones instead. Like many Minmatar ships, the Cyclone is very skill intensive. A player looking to fly a Cyclone should have strong missile skills. Energy neutralizers or vampires are often equipped in the extra high slots for PvP, although this is not a very long train. Cyclones are shield tanked more often than not in order to take advantage of the ships bonuses, so good active shield tanking skills are also recommended. No sub-article about Cyclone roles or piloting tactics. You can write them here. A simple buff here to nudge an already decent ship towards competitive viability. Re-positioned the turret hard points on the Minmatar Battlecruiser Cyclone. Fixed sails on the Cyclone Thukker Edition. Fixed solar fins on all other variants of the Thrasher and Cyclone. Inferno 1.1 Deployed on Monday, June 25, 2012. Minmatar booster locators for the Cyclone and its variants have been moved closer to the engine exhaust.